Wing span: 1 3/4 - 3 inches (4.5 - 7.6 cm). Identification: Upperside is black with white spots near the apex; forewing with red median band, hindwing with red marginal band. The winter form is smaller and duller, summer form larger and brighter with an interrupted forewing band. Flight: Two broods from March-October in the north, winters from October-March in South Texas. Caterpillar hosts: Plants of the nettle family (Urticaceae) including stinging nettle (Urtica dioica), tall wild nettle (U. gracilis), wood nettle (Laportea canadensis), false nettle (Boehmeria cylindrica), pellitory (Parietoria pennsylvanica), mamaki (Pipturus albidus), and possibly hops (Humulus). Adult food: Red Admirals prefer sap flows on trees, fermenting fruit, and bird droppings; visiting flowers only when these are not available. Then they will nectar at common milkweed, red clover, aster, and alfalfa, among others. Habitat: Moist woods, yards, parks, marshes, seeps, moist fields. 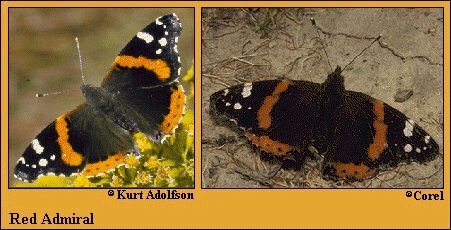 During migrations, the Red Admiral is found in almost any habitat from tundra to subtropics. Range: Guatemala north through Mexico and the United States to northern Canada; Hawaii, some Caribbean Islands, New Zealand, Europe, Northern Africa, Asia. Cannot survive coldest winters; most of North America must be recolonized each spring by southern migrants.